These microscopes are not actually for sale, but are included here to show how far the state of the art has advanced. Bausch & Lomb - (1886) This scope was first introduced in late 1885. The heavy tripod base has a spread of 6-1/4" that supports a tubular pillar. The circular stage, which could be rotated about the objective axis, has a milled edge and a 1-1/4 central aperture. The post attached to the base has an extension in front of the lower end with two grooved swinging tailpieces; one has a sliding arm and gimbal for the double mirror, and the other a sliding arm for a sub stage. The scope is all brass and measures 14" in height when closed. 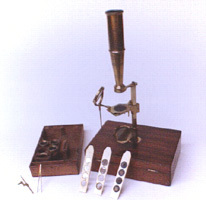 Bausch & Lomb - (1900's) This all-brass B&L microscope shows some of the changes happening in the late 1800's. There are two lenses mounted on a turret that could be rotated for different magnifications. The design remains the classic horseshoe base with the coarse focus mounted near the main tube and the fine focus mounted on top of the smaller tube (like the Leitz scopes) The scope measures 11-3/4" when closed, and has double-sided mirror (missing on this scope) mounted to a slotted tail piece so one could "focus" the illumination. There was also a swing out condenser lens for better illumination. the stand is signed "Bausch & Lomb Optical Co., Rochester, N.Y. 23305"
Carl Zeiss Jena - (1920's) The horseshoe shaped base, 4 x 6-1/2 inches, and 2-1/4 inch pillar are cast as one piece. The curved limb supports a side mounted fine focus adjustment. The rack and pinion coarse adjustment has diamond knurled knobs. The 4-1/4 inch revolving stage has centering screws; there is a swing out condenser with an iris diaphragm. Earnest Leitz - (1920's) The horseshoe shaped base of this instrument and 2 inch high pillar are cast as one piece. The 5-3/4 long curved limb supports the side mounted fine focus control with the rack and pinion coarse focus above. The body tube is 3-3/4 inches with a draw tube and triple nose piece. Earnest E. Leitz - (1893) This all-brass scope is the first antique scope I ever bought. I purchased it from a man named John Ewert, who owned a camera store in Santa Clara, CA, that was home of a large collection of antique cameras and microscopes. When I bought it the scope was almost all black from oxidation. As a collector I knew that removing the original finish would devalue the scope. I decided to refinish it as a scope to put in my office rather than resell. The scope came out well, but it took a long time. I since have collected other scopes and the first thing I check is if the finish is good shape. Thanks for getting me started, John. R & J Beck - (1890's) This scope is a student model scope signed "Beck London 12796". The triangular base measures 4-1/2 x 5-1/2 inches. The coarse focus is adjusted with a rack and pinion on the side while the fine focus adjustment is made with a micrometer adjustment mounted at the top. R & J Beck - (1895) The microscope is all-brass and comes with the popular horseshoe base of the late 1800's and early 1900's. The vulcanite stage is mounted to a brass plate and has an aperture for transmitted light. The double-sided mirror is mounted to a post below the stage. This scope came with a turret that could hold 3 objectives at once. Coarse focus is made by the knobs on the side while the fine focus is made with a dial mounted behind the coarse focus knobs. Spencer Lens Co. - (1920's) This scope comes with a horseshoe base and a square fixed stage. It has a 3 inch brass continental limb, arm, a fine adjustment, and a rack and pinion coarse adjustment. The body tube is 4 inches long; it has a graduated draw tube and a triple nose piece. Signed "Spencer Microscope ALOE CO. sales agents No. 20303"
Stanly - (1910's) This scope is a good example of a popular teaching microscope design. There is a calcite prism located near the objective that splits the light into the separate eye tubes. Coarse focus was done by the large knobs on the side while fine focus adjustments was done with the knurled knob just below where the eye tubes split. 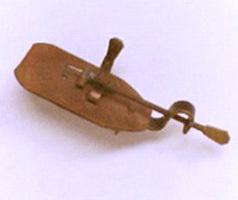 A small set of tweezers were mounted on a movable pin for viewing larger items. Aperture adjustments consisted of turning a wheel with different size holes in it. Light was provided by a mirror that was flat on one side and concave on the other. This scope is most likely a copy of the Henry Crouch brand as they were very popular scopes. Zeiss - (1970's) This Zeiss scope is a copy of the Van Leeuwenhoek. They were not sold but given away to select people. This is a authentic replica of the scope that Van Leeuwenhoek had used over 250 years ago to explore cellular structures. 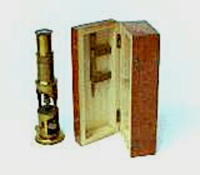 Unknown - (1840-1870) This Gould-type microscope was used around the 1850's as a field scope. All of the components will fit into a tray and the box doubles as a stand and as a storage box. There are three other magnifications that came with the scope. Changing objectives required the removal of the eye tube and threading in the new objective. This scope also came with a "live box " for viewing larger objects. (bugs) The white sticks are prepared slides in holders made out of ivory. Unknown - (?) This field scope measures 6 inches in height with the lower 3-3/4 being 1-1/2 inches in diameter and the upper being 1 inch in diameter. There is no fine focus. The draw tube is used to focus and measures 3-1/2 inches with a single objective threaded into the bottom. The 7/8 inch mirror is mounted on a pivot pin; the box is shown with tweezers.